Welcome to Drewberry’s 2016 Annual Wealth and Protection Survey. It captures the responses of the 2,000 UK workers who kindly agreed to participate in the research we conducted at the end of August 2016. 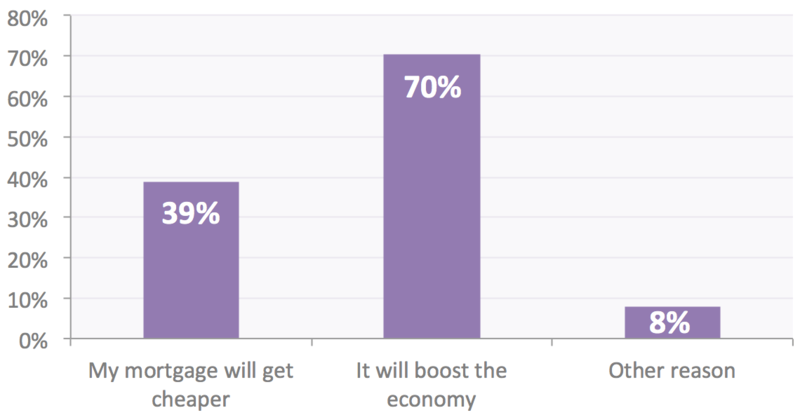 As always, our findings provide a fascinating insight into the key concerns of the average British worker and include their views on key economic developments such as Brexit and the most recent interest rate cut, how they approach issues such as savings and protection and how they view their prospects for a comfortable retirement. We think the results make compelling reading. Among other things, our research suggests that, despite the recent growth in the UK property market and the strength of the long-term returns from global stock markets, a great many UK workers face an uncertain financial future. 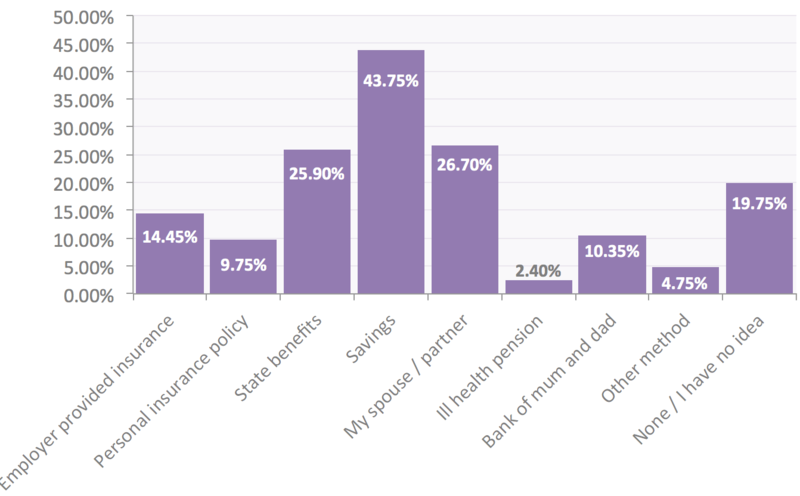 Our findings make it clear that far too many Britons are still bewildered by the practicalities of building up sufficient savings to fund a comfortable retirement while a great many more are relying on outdated savings products such as bank accounts or cash ISAs and even the value of their home as a means to fund their retirement. We think our findings underline why it’s now more important than ever before to seek reliable, professional financial advice. 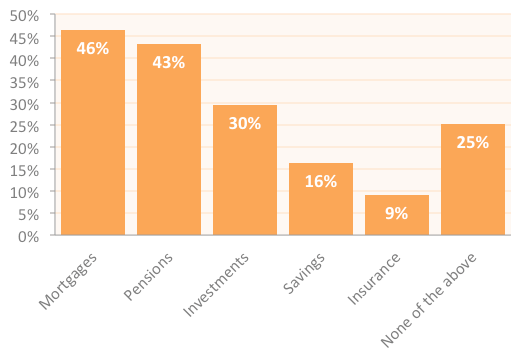 Although relatively few survey respondents recognised the value of good financial advice, it remains by far the most effective way to avert the ‘retirement crisis’ for which so many UK workers are clearly heading. Which financial products do you currently hold? Over the last 10 years, do you believe insurers have typically gotten better or worse at paying out claims? 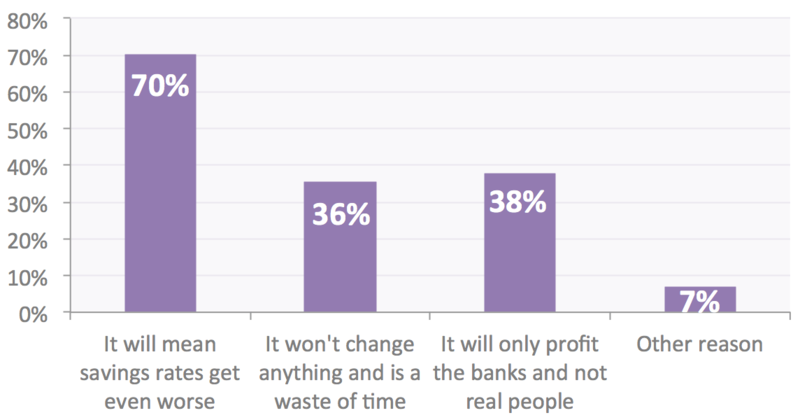 Only 8% of consumers believe that insurers have got better at paying claims. How would you survive financially if you were unable to work for six months or longer due to illness or injury? 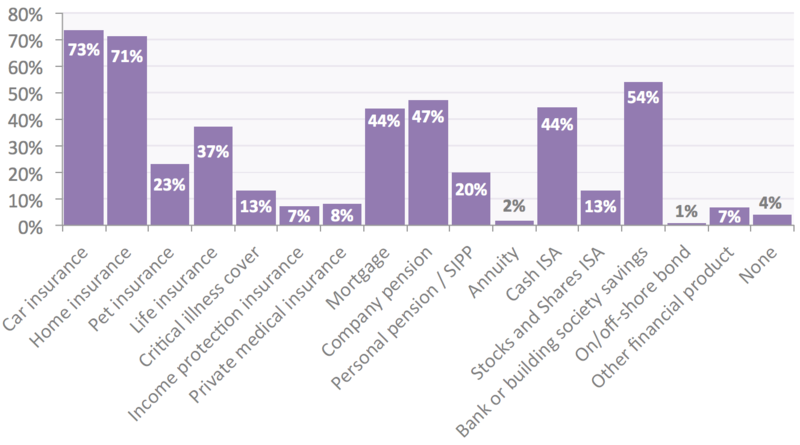 1 in 5 people have no idea how they would cope financially if they suffered long-term incapacity. Is your life insurance written into trust? Only around 1 in 10 people report having their life insurance written in trust. Have you ever received financial advice? Do you think you are better off financially as a result of the financial advice you have received? Which of the following products are you most likely to seek financial advice on? 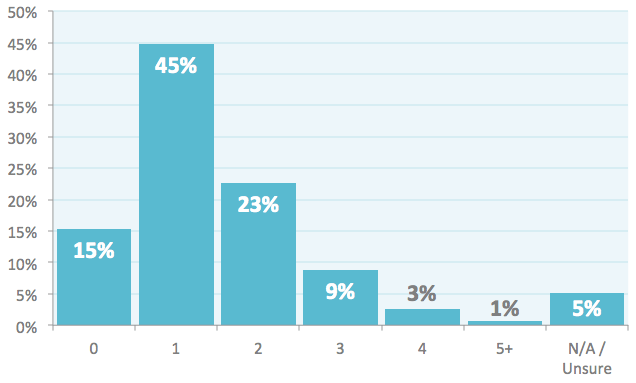 How would you typically prefer to receive financial advice? 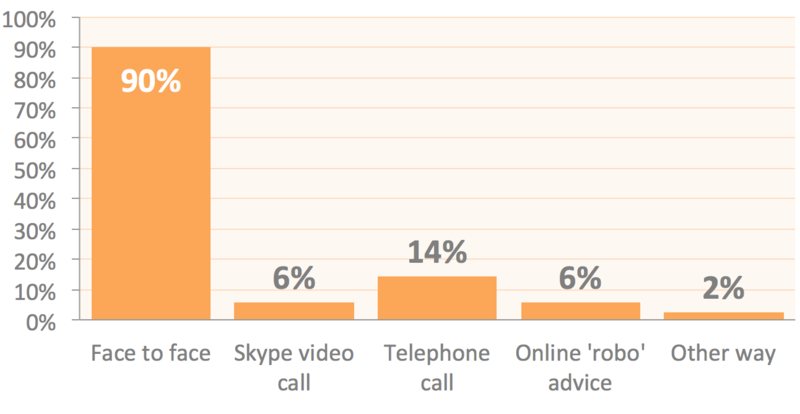 An overwhelming 90% of people would still prefer to receive financial advice in person. How much would you be willing to pay for financial advice? Imagine that a financial adviser is able to make sense of your various pensions and savings and can create a well invested, tax-efficient portfolio that provides the optimum level of income for your retirement. How much would you be willing to pay this adviser for their expertise? 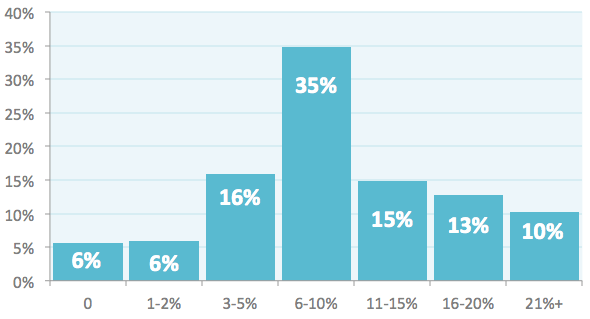 74% of people were willing to pay some amount for financial advice. 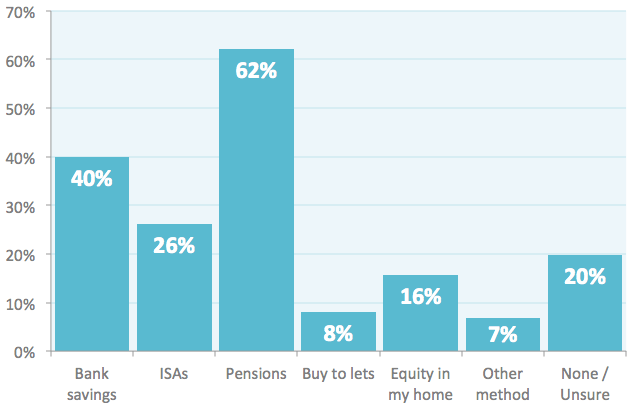 Over 20% of people were willing to pay £500 or more for financial advice. How do you plan to fund your retirement? 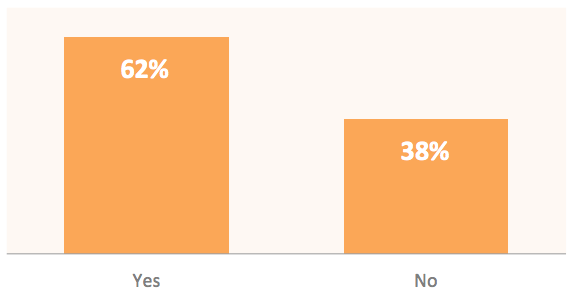 1 in 5 people are unsure how they are going to fund their retirement. How much do you think the current state pension is per annum? 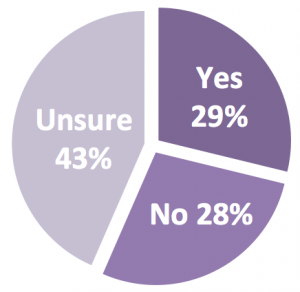 People are generally quite well informed when it comes to their State Pension entitlement. What percentage of your current income do you think you should be saving for retirement? 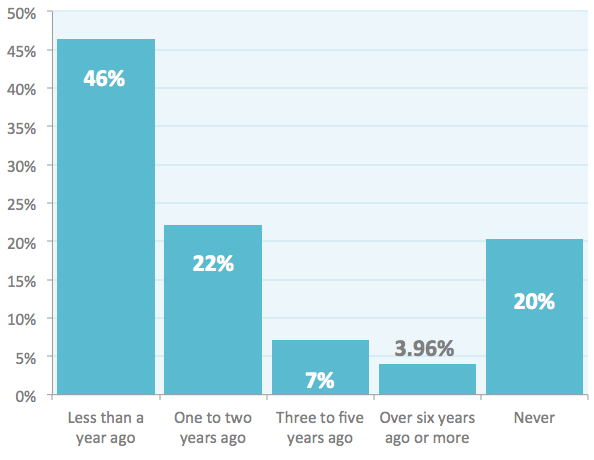 27% of people (or over 1 in 4) believe they only need to save 5% or less of their income in order to fund retirement. 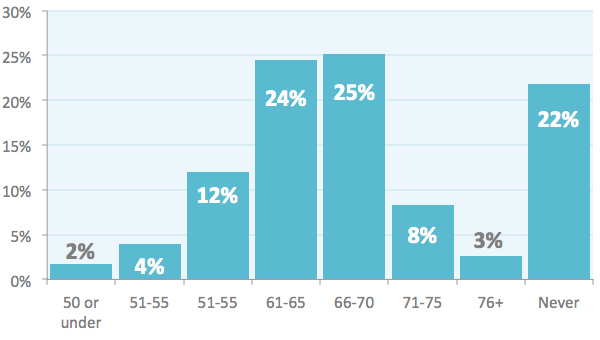 At what age do you think you’ll be financially secure enough to permanently retire? 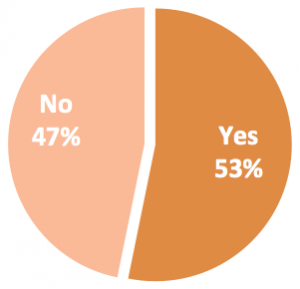 Over 1 in 5 people believe they will never be financially secure enough to retire. 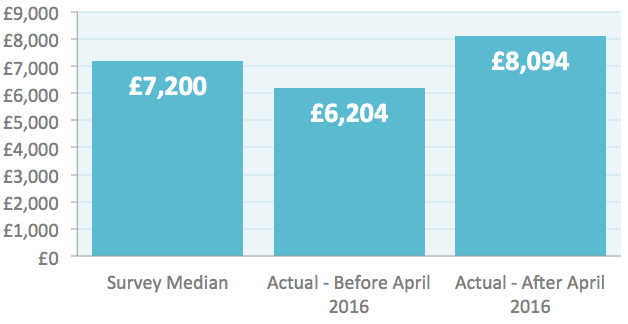 When was the last time you found out how much your pension(s) were worth? Over 1 in 5 people have never found out how much their pensions are worth. How many pensions do you have? 15% of UK workers still don’t have a pension while 13% have three or more. What size pension pot do you think you will need at age 65 to provide you with a guaranteed income of £15,000 per annum for the rest of your life? 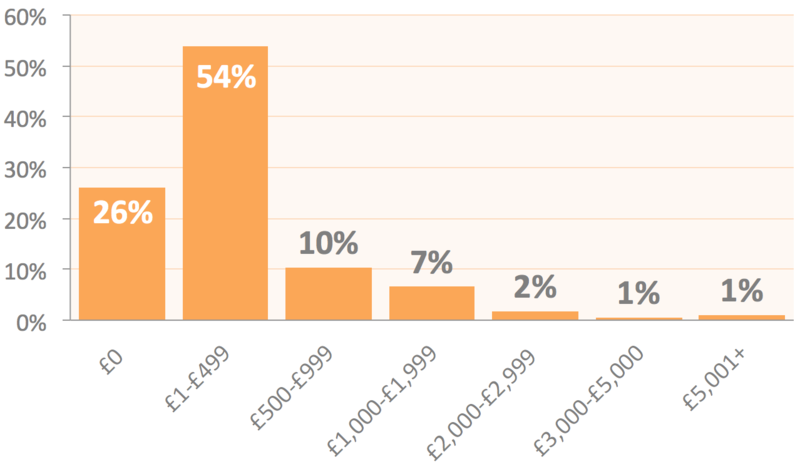 Taking the survey median, a single life annuity for £15,000 per annum would require a 32% larger pension pot without inflation linking and a whopping 140% more with RPI linking than was thought by our survey participants. Do you think the Bank of England was right to cut interest rates further? Why do you think the Bank of England’s decision to cut interest rates was correct? Why do you think the Bank of England’s decision to cut interest rates was wrong? In the aftermath of Brexit, what are you most worried about? Do you have any secret bank accounts or savings that your spouse doesn’t know about? 18%, or nearly 1 in 5 people, admit to having a secret bank or savings account their partner doesn’t know about. 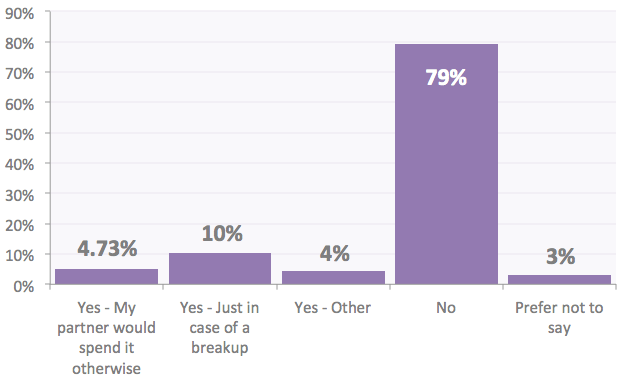 Nearly 1 in 10 admit that their ‘secret account’ is in case of a breakup. If the fund managers investing your savings offered you the chance to vote at the annual general meetings (AGM) of the companies in which they had invested your money, would you accept? If you were to attend an annual general meeting (AGM), on what issues would you be most anxious to have a say?